Eliminate Annoying Spam™ with iHateSpam. It gives you control over that ever increasing flood of annoying and time-wasting email. Runs under Windows 95/98/ME/NT/2000/XP. Currently supports Outlook and Outlook Express only. 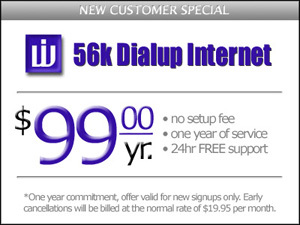 Get a month of FREE Internet access ! Refer a friend and have them mention your name when they sign up. It's that easy ! Use our web-based email solution to send and recieve email or manage junkmail filters for catching spam. Click HERE to login.